My birthday was yesterday. It was a wonderful day with my partner Jim and my sons. This week we will also celebrate with my folks, my sister and my cousins. My dad is in the throws of dementia. I had to explain to him recently what a cd was and why that silver disk played music. That being said, he knew to call me at the moment of my birth yesterday, as he has done habitually over the years. At 9:50 am, the time I was born, I always got a call from my dad. I prepared myself this year for the idea that he would not remember it. Prepared that it would have gone the way of so much of what he once held in his mind. It did not. He called, right on time. Senility, be not proud. My dear friend Ken Jansen’s birthday is today, and he shared his thoughts with me. We have a lot in common. Both of us are gay dads, and both of us are committed to making this a better world for those who are coming up behind us in it. 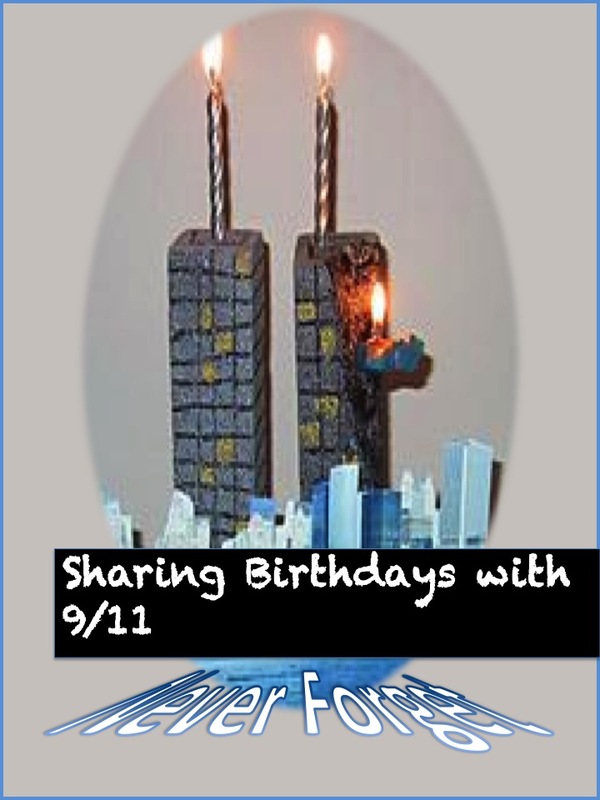 We both also share memories of a dozen years ago when terrorists hit our country, right at our birthday time. Happy birthday us. On that particular day, it was the least of our worries. That year, I was alone in a hotel room a thousand miles away from my family on my birthday the 10th. When I woke up the next morning, the world had gone crazy. As I dressed, I watched the news about a plane hitting the World Trade Center. Then I watched as another hit the other tower…live. I watched the first responders going into the scene… never to emerge alive again. I had to get home. I called the rental car company and let them know that I would be driving the car I rented a little further than the local airport as I had agreed. They could sue me if they did not like it. They understood. The drive home was eerily quiet on the west coast. I dropped in on my sister who never dreamed she would see me that day and we quietly shared a sandwich. It was as if we were alone in the world, around us had gotten devastatingly calm. Terrorists hit our consciousness, we had the overwhelming urge to run to family, and be damned glad to have them safe. Lunch and communing with my only sibling done, I continued on my journey. I continue it today, in a different way. Twelve years ago, the villains were very clear. Evil men with box cutters exploiting a cavalier and lazy security system. The things that go through your head when you turn fifty-two! Every year, as September 11 rolls around, I sit back and think about how fortunate I am. I think about my family and friends, and how lucky I am to have them in my life. That reflection became much more poignant after September 11, 2001. There’s no need to talk about the events of that day, I don’t think there’s anyone who doesn’t know what happened in New York City, Washington, and outside Shanksville, PA. The day after, I was asked by a coworker if it was my worst birthday ever. I answered “yes”, then thought for a second and said “no”. In reality, it was probably the best birthday I had ever had. I was able to go home from work, to my family, to be greeted with hugs by my then 2 year old son. I was fortunate in that nobody I know, personally, was involved in any way. Now each year, I think about my life with a different type of scrutiny. My family has grown, but is no no way any less important to me. My love for them grows more every year. They know that, even though I can be a bit of a pain, and that I’ve become very vocal standing up for what I believe, I will always love and respect them. My friends know the same thing. The past twelve years has taught me that the people I allow to surround me, strengthen me, support me, and hold me to a standard that I have given them. My “Friends List” on Facebook has a (to me) surprising diversity to it. It is also loaded with people that five to six years ago, I would never have thought would be there. There are people there who are making an enormous impact on the world as a whole, some who are making themselves known on a local level, and some who are there because I invited them in. However, every one of them is there for a very distinct reason. It’s easy to look at that list, and realize that these are people who accept me as I am. These are the people who inspire, who helped open my mind and heart. The ones who helped to find my voice, and let me know that it’s okay to yell. And for that, I’m eternally grateful. Then there’s the other side of the coin. The negative influences. The people who are no longer a part of my life, because they were the ones who thought (and in some cases took great pleasure in telling me) that I was worthless, had nothing of value to give the world. While I have left those people behind, I need to take a moment to thank them, too. Having had them in my life, and having met the people I now have in my life, has taught me that I do have value, that I can add something worthwhile to “the human experience.” They taught me to look for the signs that a relationship will be “toxic,” and to avoid that relationship. They are the ones who helped me “give birth” to the inner strength I now have. The strength that is “fed” by the people who are now a part of my life. The first forty-eight years of my life were a roller coaster, with a lot of ups and downs. The last four years, have been more of a walk up a mountain. Thanks to the support of so many people, I feel that I’ve climbed high enough to be free of the clouds, and standing in bright sunshine. And for that, I thank every one of you. That word “Thanks” will never be enough, but it will have to do, for now. One last thing. I’m going to request a “gift” from each person reading this. It’s something my son-in-law asked for on his birthday, a couple of weeks ago. Go out and do something for someone who needs it. Help a neighbour take their garbage out. Carry someone’s groceries. Buy lunch for a homeless person. Anything. Just give of yourself, and you’ll be doing it for me (and for Rob). Much love to everyone of my family and friends. Ken Jansen is part of the Equality Mantra team and has been guest blogger on evol=. This entry was posted in Uncategorized and tagged 9/11 birthdays, Family, gay dads, ken jansen, Rob Watson. Bookmark the permalink. queue the Twilight-Zone music! I too experienced 9/11/01 alone in a hotel room preparing to present at a conference. The conference was cancelled. I too ended up driving a rental from LA to San Diego – of which – they waived the drop fee – all things considered. The drive from LA to San Diego – also surreal . . .every driver was most conscious, no tail-gating, everyone highly considerate of each other. I could see everyone rapt in attention to their radio’s. Since last year, my daughter shares Birthdays with you too and each time I’m asked the date everybody makes a comment about it, even if we live in a small country on the other side of the oceans. I also remember clearly of myself sitting and zapping in front of my televison untill I crossed the news about the first plane and then watched the second one live… so all I can say is happy Birthday and pray for peace! Happy birthday to you both. It’s too bad this day has to have such tragic memories since many wonderful things have happened before and since on this date. I will, as always, find a way to be of service where ever possible but this time, in your honor.